It’s one thing to break a track record, but it’s another thing to do it in a big final after finding interference. That’s exactly what Orson Allen did in tonight’s $67,000 Group 2 CHS Group Horsham Cup (485m), overpowering the front-running Nervous An Weird in 26.87sec. The previous track record of 26.876sec was set by Got Some Wheels last November. Two months shy of his third birthday Orson Allen appears to be at the peak of his powers right now, having won the Cranbourne Cup and running second in the Group 1 Temlee in recent weeks. However, handler Joe Briffa suggested we may not have seen the best of Orson Allen just yet. “He just keeps on improving and he’s starting to work out how to come from behind. He’s a real flying machine. 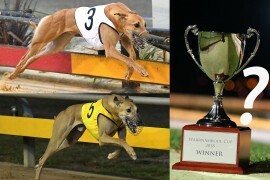 He’s one of the best dogs in Australia at the moment,” Briffa said. As expected, Nervous An Weird (Andrew Paraskevas) was dynamic early from box one, clocking a sensational 6.39sec to the first section as Orson Allen settled in second position. However, a dash for the rail by Orson Allen saw him cop a check, pushing him two lengths off the pace turning for home before powering to the lead in the home straight and winning by 2.5 lengths. “He got in front of Barooga Brett at the start (while) Nervous An Weird jumped brilliantly and I thought he (Orson Allen) might be in a little bit of trouble, but he worked home really well and to break the (track) record is unbelievable. He’s just flying,” Briffa said. Bred and owned by the Wheeler family in NSW and trained by Correy Grenfell and Avalon, Orson Allen (KC And All – Desalle Bale) has now had 23 wins from 47 starts, with the $47,000 first prize taking his career earnings up to $313,645. Heats of the $150,000 to-the-winner Group 1 Perth Cup (520m) will be held on 16 March at Cannington, with the final to be run on 23 March. WATCH: Orson Allen (5) wins the Horsham Cup in a track record 26.87sec. WATCH: Incredible run lands Orson Allen his second consecutive cup. Orson Allen is happy and content after his record breaking win. The semaphore board displays Orson Allen’s track record 26.87sec. Chris Hopper of CHS Group presents Joe Briffa with the Cup. Horsham Cup placegetters (from left) Italian Plastic (Harry Manolitsis), Orson Allen (Joe Briffa) and Nervous An Weird (Andrew Paraskevas). Orson Allen and Joe Briffa with the Horsham Cup. Orson Allen powers to the finish line after finding interference. Trouper takes out the Jan Wilson Memorial, a race named after the former GRV Chair. Trouper wearing the Jan Wilson Memorial rug. Henessy Venom wins the Sylvia Penny Memorial, named in honour of the Horsham GRC legend. Major Riot wins the Horsham Cup Consolation in a sizzling 27.10sec. Major Riot at the presentation of the Horsham Cup Consolation with handler Paul Abela, Horsham GRC President Ian Bibby and Chris Hopper of sponsor CHS Group. Compiled by Andrew Copley and Jason Adams. Photos by Clint Anderson.